Smashing mammalian mendacities with his titanic footfalls. Since my interest in ancient civilizations began years ago, I’ve increasingly believed we modern humans don’t know much about much. We just think we do. Even when we use the word “modern” to describe ourselves, it resonates tones of arrogance by implying that we have made it – that we have finally graduated from stupid to smart, from religion (or superstition) to science. We have a whole world full of evidence that supports the biblical account of Creation but we’ve been spoon-fed an interpretation of that evidence borne out of rebellion to God and therefore cannot have any basis in fact. Of course, I’m talking about human evolutionary theory – that Man was way stupid before he was way smart and even before that, he was just a molecule of scum in a puddle. Forbidden Archaeology. We rarely hear about these discoveries because they don’t fit into the established, traditional, evolutionary timeline of the history of the earth and Mankind. For this reason, they have been dubbed Out-of-Place Artifacts, or OoPARTS, and banished to the fringe-tinged scientific discipline of Forbidden Archaeology. This implies that, somehow, these artifacts aren’t supposed to be where they’ve been found. They become anomalies. However, I would say that they are exactly where we would expect to find them when we realize the Bible is the true account of the history of Mankind. For more astonishingly eye-opening discoveries, I recommend visiting this web site. It is an OoPARTS mega-site based on the 6-day Creation account in Genesis. I can’t honestly say I support every interpretation on the site but, nonetheless, it’s quite fascinating. Also, be sure to visit the blog that goes along with the site. There’s a very good show on H2 called America Unearthed. It can also be viewed On Demand for those of you with this capability. I like the show because, unintentionally, it supports a biblical view of world history by casting doubt on and showing flaws in the traditionally accepted historical and archaeological timeline of the history of Mankind. Why would they draw one? How would they know what to draw unless they had actually seen one? 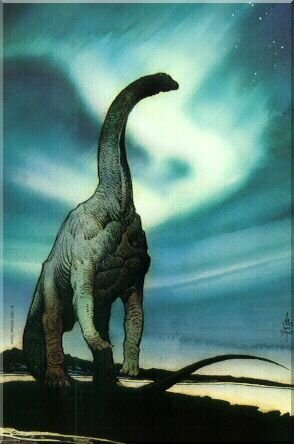 This, along with many other drawings and carvings of dinosaurs we never hear about, is evidence that Man co-existed with dinosaurs just like the Bible says and that the earth is indeed as young as the Bible says. Viewer Discretion: In the most recent episode, I was disappointed to learn that the author has come out in support of the theory that Jesus and Mary Magdalene had a child and that the Knights Templar believed they were their direct descendants. This is partly based on his work on the hooked x runic symbol which has appeared on a number of inscriptions in America and around the world. This, of course, is not biblical so be warned – and it does not mean that all of his research is to be dismissed. Dr. Jack Cuozzo, a Christian, is an Orthodontist. In this fascinating book, he tells how God arranged it so that he was actually allowed to handle, study and test some of the fossil remains that have been interpreted as early pre-human ancestors in order to support human evolutionary theory. Being an orthodontist, he subjected the skulls to certain tests never before performed on them. The main premise is that the skulls labeled as belonging to so-called Neanderthal Man are actually the skulls of the people who lived before the Flood of Noah. The human skull never stops growing and, because these people lived for hundreds of years, that gave them the pronounced jaw and forehead which evolutionary science attributes to an ape-like ancestor. Look at some pictures of really old people to see for yourself. This excellent book also contains documented photographic evidence that human evolutionary theory has been fabricated, often with Plaster of Paris, and also photographic evidence of human co-existence with dinosaurs, just as the Bible says. The author that helped uncover my passion for this subject, and was a catalyst for me to launch my own investigations in this area, is Graham Hancock. Graham is not a Christian, but I would recommend reading the books I’ve listed below because they chronicle evidence that is blatantly ignored by mainstream archaeology about Man’s past. When you are made aware of all of the evidence that exists around the world pointing back to the dispersion of the people groups at the Tower of Babel, you will come to no other conclusion than Man chooses to ignore it out of his rebellion toward God. I’m saddened to say, however, that Graham and his buddies, who have been so diligent in uncovering these things, have recently fallen prey to the very New Age religion practiced by all of these cultures. So, I would be wary reading his more recent books. Use your biblical discernment when studying these things. Graham has also been featured in one of Bob Cornuke’s excellent Bible Explorer Series DVDs. Dr. Cornuke, a Christian, is an explorer and the founder of the BASE Institute. He has produced these excellent DVDs of his explorations and research. It’s real boots-on-the-ground stuff. There are 4 in all: Search for the Ark of the Covenant, Search for Noah’s Ark: The Lost Mountains of Noah, Search for the Lost Shipwreck of Paul and Search for Mt. Sinai: Mountain of Fire. In Search for Mt. Sinai you can actually view video footage of the altar of the golden calf, the split Rock of Horeb, what looks like a burnt mountain top and more which are located in Iran and guarded by the Iranian military! Of course, the question is, why are they guarding it unless they know what it actually is? For those of you keen-minded individuals who would immediately notice that these DVDs challenge the traditional locations of these things, I guess you’ll just have to watch them to find out why. This series on the Pyramids at the Giza Plateau in Egypt is quite simply the best and most sensible explanation of their function I’ve ever heard. I hold to the belief that the pre-Flood civilization was privy to knowledge and technology that we do not understand today, the remnant of which was spread around the world during the dispersion of the people groups at Babel. This would also account for the similarities in myths (which became religions), megalithic architecture (according to the stars above) and Flood stories that almost all ancient cultures around the word share. I was pleasantly surprised at the content of this series as it serves to support this view even though one could get the feeling that it slightly encourages viewers to explore the New Age religion. The reality is that true world history will always point to the Book of Genesis despite the intentions of the authors’ interpretation. Unfortunately the link to the web site seems to be broken, but here’s a link to an independent site promoting the series. Again, even though the alternative Egyptian chronology suggested in the series may not match up entirely with biblical chronology (I haven’t personally made the comparison), the important thing to take away from it is that this series shows the faults in the traditionally agreed-upon timeline of Egyptian society and the downright arrogance of those who choose to ignore these things (much like the arrogance present in the excellent Expelled: No Intelligence Allowed documentary). This series can also be viewed on Netflix if you’re a subscriber. This web site will really stretch your thinking about the Book of Genesis. It supports a theory I’ve held to that the similarity in world-wide myths, religious beliefs, Flood stories and megalithic architecture is a result of the events before the Flood and the events at Babel. Imagine my delight when my pet theories were corroborated and supported by another who was studying these very things. I can’t wait to read and review the books and DVDs by this author. What should you take away from OoPARTS and Forbidden Archaeology? Some very good questions for you to consider would be, why are these things hidden from us? Why is a world full of evidence being ignored and even covered up? The reason is the truth about the history of mankind will always point back to the Bible – Babel, the Flood, the Genesis 3:5 lie, Creation, God and, ultimately, Jesus [Colossians 1:15-20]. From Satan’s point of view, there’s always the danger that someone who discovers the truth about world history and our origins will eventually find Christ and be saved. So, even though some of these discoverers are not Christians and sometimes attach ages of time that do not fit into the Bible’s timeline to things they’ve found, they should not be dismissed outright. It’s only proof that the evidence is so plentiful and overwhelming, even non-Christians know it exists. It’s the evidence that’s important. And it shows that the traditional timeline of human history that has been produced by human evolutionary thinking is not quite as solid as we are led to believe. In fact, it’s in no way coherent at all. This should bolster our faith and encourage us in the face of untruths. These artifacts and evidences have been professing God’s handiwork for ages and can no longer be ignored. It is my hope that you will find these resources helpful and that this will be the first in an ongoing series about Forbidden Archaeology to be published on my web site by God’s grace. Very interesting stuff!!! Thanks for sharing. I’m “blogging it forward”!